SEE the Parliament House, the Victoria Theatre and the Old Supreme Court Building. VISIT the Singapore Botanic Gardens. Singapore, once considered to be a mere hop-over in favor of more exotic locales in Asia, has now emerged as one of the top travel destinations on the planet. One of the things that sets the city apart from most of Asia is its groundbreaking architecture. 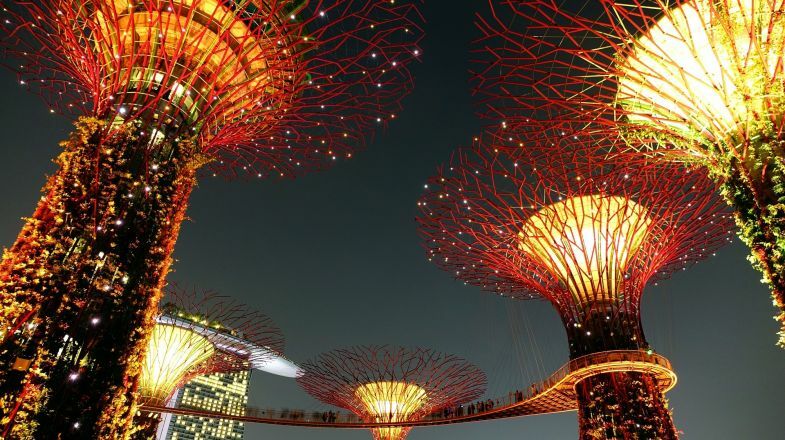 The city is home to some of the most magnificent examples of engineering, right from the solar power super trees of Gardens by the Bay to Marina Bay Sands. Singapore is also famous as a haven for kids. It may not bring all those childhood Disney characters to life, but it certainly presents a range of theme parks and exciting rides in Sentosa Island. Universal Studios Singapore is sure to be the biggest highlight of Sentosa, but you’re equally likely to fall in love with attractions such as Port of the Lost Wonder, Dolphin Lagoon, Song of the Sea and Underwater World. Explore Marina Bay and discover attractive waterfront, great shopping, marvelous landmarks such as the Marina Bay Sands, the Helix Bridge, and cultural venues like the Art Science Museum and parks with wildlife. Go to the Gardens by the Bay, the multi-awarded horticultural establishment and one of Singapore’s top attractions. Acquaint yourself with plants from all over the world and observe the Gardens from the OCBC Skyway. Visit the Buddha Tooth Relic Museum in Chinatown to get acquainted with the Buddhism. Also, examine mythological beings and Buddhist relics. In Little India, take a look at Hindu, Muslim and Buddhist structures and enjoy great shopping. Visit Sri Veeramakaliamman and Sri Srinivasa Perumal temples in Little India, devoted to Hindu deities Kali and Vishnu. Enjoy splendidly landscaped areas of the Singapore Botanic Gardens. Take a Singapore Cable Car ride between Sentosa Island and Mount Faber to experience great views of the city. Relax on the exotic beaches of Sentosa Island. Use the MRT train system to get around in Singapore efficiently. Crime levels in the city-state are very low, but examine local regulations before you come to Singapore. Many ordinary things like feeding pigeons throughout the rest of the world are punishable here. If you use someone’s internet without the consent, you risk a huge fine, a jail or both. If you spit on the street or fail to flush a toilet, you will be badly fined. ATMs are omnipresent in Singapore and major credit cards are widely accepted. English is one of the official languages here. Atop the Marina Bay Sands, you can enjoy swimming in a pool and appreciate views over the city.